Torchlight II is going to be a heck of a lot bigger than Torchlight. Runic founder Travis Baldree has written a blog post on the game's site detailing just how much bigger. 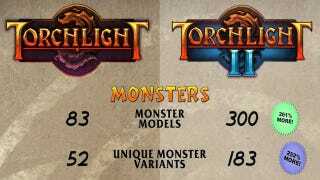 By his reckoning, Torchlight II is about four times the size of its predecessor.